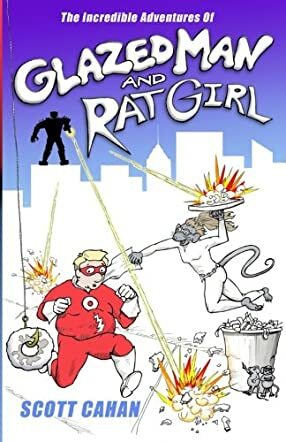 Glazed Man & Rat Girl: The Origins by Scott Cahan is a middle grade story about the overweight, donut loving Johnny Crumb who just wants to be a police officer. After he fails the tests, the police chief tells him he is not police material, but with all of the officers down with the flu, Johnny Crumb is offered the job of temporary security guard. But an hour later, as Johnny is eating donuts and celebrating his new job, a storm brews on the horizon. All of a sudden, he hears a loud bang as a lightning bolt strikes the pole next to him. It explodes, throwing him into the air, and he lands in a goldfish pond. Then, he is electrocuted once again as a power line drops into the water. This is where Johnny Crumb goes from a plain guy to a super hero. And with RoboCreep on the loose, the town of Megalopolis is in sore need of a hero. I had an entertaining time reading this book. The illustrations are amusing and the story line is super cute. Glazed Man made me laugh out loud many times. He may not be the brightest crayon in the box, but his heart is in the right place. And then there is Rat Girl who has been turned into a half rat half girl by a bunch of mutant Star Trek rats whose goal is to rid the world of humans. I loved, loved, loved this story. The wholesome humor contained in it makes it a classic. And the three rules Glazed Man has been taught by his parents are the perfect rules to live by. Awesome job by Scott Cahan with his remarkable imagination in bringing to life Glazed Man and Rat Girl. I look forward to the next installment of this amazing adventure.